This week on Designers Book Shelf I got a lot of reading suggestions for you. Every Tuesday I will be posting new suggestions of books for designers and everyone that loves design and art in general. Check out what I have for you this week and stay tuned for more next week. If you interested in sending your book suggestions, leave a comment or email abduzeedo@gmail.com with the subject Designers Book Shelf . Big special thanks to the suggestions of Sander Nijssen and Pete Morley. Designers are quick to tell us about their sources of inspiration, but they are much less willing to reveal such critical matters as how to find work, how much they charge, and what to do when a client rejects three weeks of work and refuses to pay the bill. 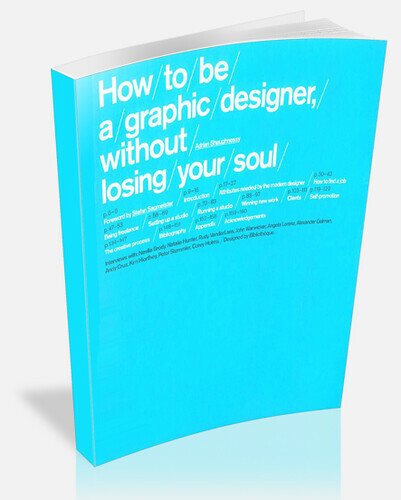 How to be a graphic designer without losing your soul addresses the concerns of young designers who want to earn a living by doing expressive and meaningful work, and who want to avoid becoming hired drones working on soulless projects. 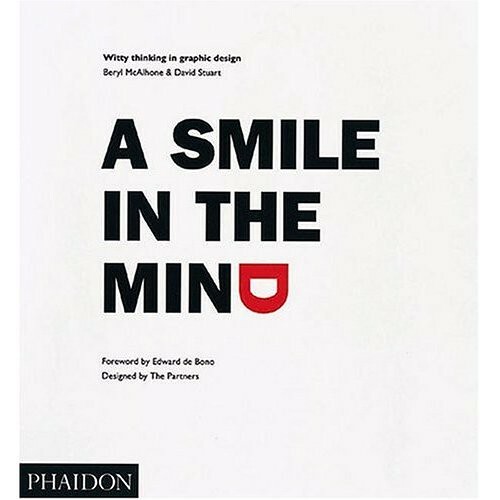 Written by a designer for designers, it combines practical advice with philosophical guidance to help young professionals embark on their careers. How should designers manage the creative process? What's the first step in the successful interpretation of a brief? How do you generate ideas when everything just seems blank? How to be a graphic designer offers clear, concise guidance for these questions, along with focused, no-nonsense strategies for setting up, running, and promoting a studio, finding work, and collaborating with clients. The book also includes inspiring interviews with ten leading designers, including Rudy VanderLans (Emigre), John Warwicker (Tomato), Neville Brody (Research Studios), and Andy Cruz (House Industries). All told, How to be a graphic designer covers just about every aspect of the profession, and stands as an indispensable guide for any young designer. (Amazon) If you are in commercial art field, regardless whether you are in graphic design or not, you must read this book. It tell you everything you wish your design school teachers had told you about the business of being a commercial artist. As an art school instructor myself, I made this book into a recommended reading material for my graduating illustration majors. Just cross the words "design" in this book and write over "illustration" (or animation, advertising, or whichever commercial art occupation), and more than 95% of it works. It is because this book does not teach you the tricks and gimmicks, but teaches you the philosophy of the business of being a commercial artist. (Amazon) The Art of Looking Sideways is an instruction manual of sorts for adults to deconstruct their preconceived belief systems of reality. Readers are encouraged to look, see, explore, turn upside down, rip apart, and to ultimately rebuild that which everyday people believe to be true through a series of word plays, found quotations, paradoxes, and unusual truths. There are no answers. Just questions, and differences of perception. The book challenges, enlightens, entertains, and ultimately inspires. It's absolutely not a book of gee-whiz optical illusions, a la psychedelic "Mind's Eye" pointillism or perception bending Escher, but rather a playful, witty scrapbook of collected thoughts, newsprint clippings, poetry, photographs, illustrations, and assorted junk found on globe trotting vacations by the book's compiler. The design of the book itself is a work of art. No two pages are the same. Each idea, or question, is presented with it's own lyrical typeface and placement to further convey the essence of the topic at hand. At my count, there are well over 1,000 different original works of typography and layout -- a stunning feat in and of itself. "Sideways" is quite simply a fringe experience that is impossible to label, describe, or place in a particular section of a bookstore. As a designer, I felt more inspired, more aware, more energized after just a handful of pages than I can remember feeling in years of buying design and art related books. It's big, heavy, and worth its weight in gold. A classic. 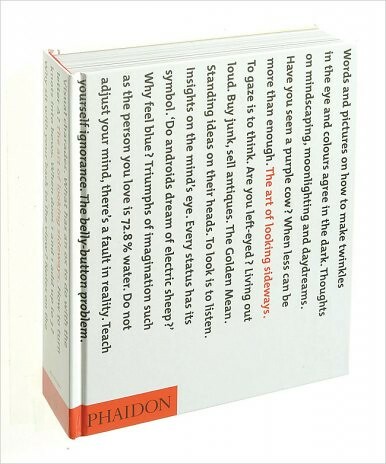 This text explores witty thinking, looking at clever ideas rather than funny drawing, and gathering together the best examples of graphic wit since the 1960s. Work is included from more than 300 designers in the US, Britain, Europe and Japan. (Amazon) If graphic design to you is pretty decoration and the latest cool font then this book is not for you... However, if you want to gain the ability to apply witty and conceptual thinking to create communicative and memorable graphic images, then buy this book! Concept and wit (two forgotten tools in the "computer first" design education in today's schools) can aid the designer in creating work that provokes the viewer to solve clues in his/her mind, sometimes resulting in a smile or "aha!" When this happens the graphic image leaves a lasting impression because the viewer has participated in it's closure. Some may consider the contents of the book "old school." But good examples of wit and ideas are two things that will never go out of style! What makes an advertisement memorable? Creative Advertising unravels the creative process behind some of the most original and effective campaigns of recent years. Mario Pricken showcases over two hundred examples of international advertising from a wide range of media including magazines, billboards, television, movies, and the Internet. 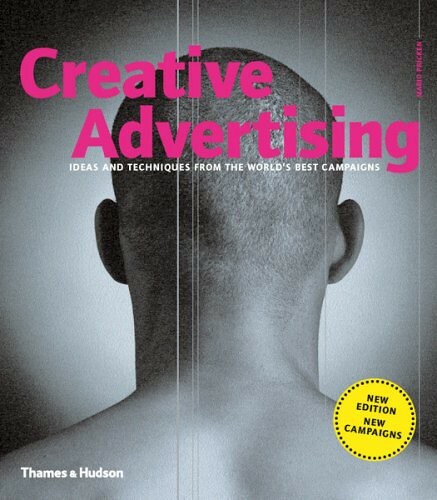 Each chapter highlights different practical methods for creating innovative and unforgettable advertisements, from finding the elusive "big idea" to reworking classic techniques. The selection covers award-winning work from some of the biggest and most influential names in the industry, such as J. Walter Thompson and Saatchi and Saatchi, along with exciting young agencies such as London-based Mother Ltd. All demonstrate a fascinating range of approaches, including ways of visualizing concepts, the art of illusion and paradox, using metaphor and analogy, and deploying shock tactics and humor. Interviews with international luminaries of the advertising world provide invaluable insights into the working practices of top agencies. Entertaining and inspirational, Creative Advertising is an indispensable book for designers, art directors, copywriters, and students of advertising. Over 450 illustrations, 380 in color. (Amazon) This book is an outstanding resource for anyone interested in learning about developing and fostering creativity. Mario Pricken's techniques focus on applications in creative advertising. However, both his "DreamTeam" group work techniques and his "KickStart Catalogue" are valuable tools for creating novel ideas in any field. Pricken supports his techniques and theories with stunning visuals from award-winning campaigns from around the globe. He stresses the importance of applying his techniques, specifically the "DreamTeam", in creating advertisements that deliver results. The bulk of Pricken's material is composed of the "KickStart Catalogue". This section outlines numerous creative techniques that can be used to elicit novel ideas. The author backs up each one of these techniques with applications to creative advertising. The purpose of the section is to act partly as a guide for creative thinking and to act partly as inspiration for new ideas. The "DreamTeam" guidelines are a great resource for encouraging creative thought in groups. In this section, Pricken outlines what is needed in a work environment to build creativity instead of breaking it down. Additionally, the author outlines other classic creative techniques that can be applied to all fields including creative advertising. He recounts timeless techniques including storyboarding, first developed by Walt Disney in the early 20th century. Pricken delivers a stunning finish to his work by outlining several interviews with industry professionals. Marketing professors, graphic designers, account executives, and creative directors in the top of the domain all recount their take on the world of creative advertising. This book's strength lays in its stunning use of visual examples to support the author's somewhat stretching theories. Pricken's careful eye and meticulous research shine through in this work. The only problem with this book is the slight over analysis of some creative techniques. Pricken is guilty of what many marketers often do: over complicate their craft. Many of the theories put forward can be condensed into groups. While his thoughts are well researched and developed, they can be perceived as mechanical interpretations of otherwise innate processes. I would recommend this book to anyone curious about marketing, communications, or simply anyone who has ever enjoyed a creative advertisement. Authoritative, eye-popping, and massive, Art of Modern Rock is the first and last word on contemporary concert posters. An art form that has grown hand-in-hand with the independent music scene, heralding small and large gigs alike, the posters have emerged from visually creative street-level notices to prized collectibles rendered in a variety of styles and media. Today's poster artists combine the expressive freedom pioneered in the poster revolution of the 1960s with the attitude and the do-it-yourself approach of the punk scene, creating an unprecedented surge of innovative poster production on an international scale. 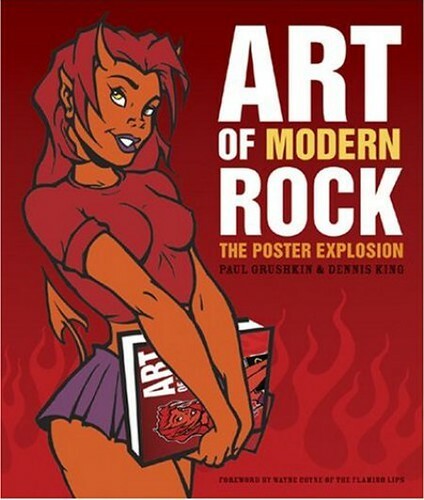 Featuring over 1,600 exemplary rock posters and flyers from over 200 international studios and artists, Art of Modern Rock is the long-anticipated sequel to coauthor Paul Grushkin's The Art of Rock. Profiles and quotes from the pioneers in the field and their emerging heirs share nearly 500 gloriously packed pages of poster after mind-blowing poster. As brash and colorful as the burgeoning scene it documents, Art of Modern Rock is the must-have book for music and poster fans and collectors. (Amazon) As I have been looking forward to the release of this book for two years now, when the package first arrived at my house I was a little afraid to open it. Would this book live up to my high expectations? I quickly got over my fears, ripped open the box and pulled out this gorgeous, colorful, HEAVY piece of art history in the making. Every single page is filled with amazing full-color posters, interviews, and photographs. My favorite thing about the book is the photos of the actual artists-- seeing what these talented folks look like, and getting glimpses into how they actually work in their respective environments. Impress your friends, show how hip you are and buy this book! The past few months have been really difficult for me. My father passed away, suddenly at the end of August. He was my biggest inspiration, role model and mentor. It is hard to explain the void. There's a feeling that the things are incomplete.